The new team, which is based at Toyota Motorsport GmbH (TMG) in Cologne, Germany, will make its race debut on 5 May in the Six Hours of Spa-Francorchamps, the second round of the FIA World Endurance Championship. 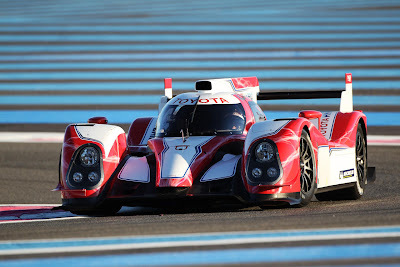 Toyota Racing intends to enter two TS030 HYBRID cars in the subsequent Le Mans 24 Hours (16-17 June. Participation in further rounds is yet to be confirmed. A driver line-up of Alex Wurz, Nicolas Lapierre and Kazuki Nakajima has already been confirmed for one car while discussions are still ongoing to finalise the driver line-up for the other. Additionally, Andrea Caldarelli, from Pescara, Italy, has joined Toyota Racing as a junior driver. 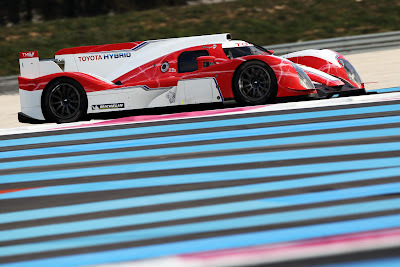 The TS030 HYBRID is Toyota's successor to the iconic TS010 and TS020 cars which participated at Le Mans with podium success during the 1990s, with TS an acronym for ToyotaSport. Toyota is the first manufacturer to confirm its participation in the FIA World Endurance Championship using a hybrid system, emphasising the pioneering approach to this technology which has seen more than 3.5 million Toyota hybrid vehicles sold worldwide. The THS-R (Toyota Hybrid System – Racing) powertrain is designed to deliver maximum performance and features an all-new V8 3.4 litre normally-aspirated petrol engine and hybrid system with capacitor storage developed by official team partner Nisshinbo. The team will use the TS030 HYBRID's first test to evaluate the merits, within the current regulations, of a front motor system produced by Aisin AW and a rear motor system developed by official team partner DENSO. Those regulations limit hybrid systems to recovering a maximum of 500kJ between braking zones whilst restricting deployment to only two wheels. A brand new carbon fibre LMP1 chassis has been developed and produced at TMG, where the complete car was assembled for the first time in preparation for a roll-out on 11-13 January at Paul Ricard. 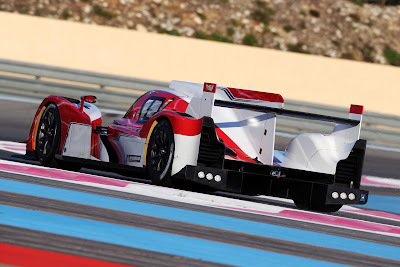 During an exclusive test session at the French track, which included running in darkness, the TS030 HYBRID completed several hundred kilometres, showing an impressive level of reliability and performance for this very early stage in the car's testing programme. 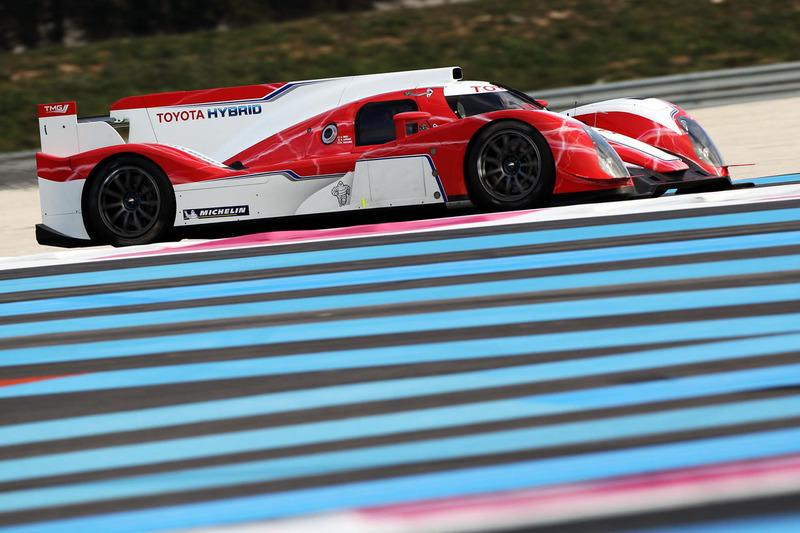 Alex Wurz and Nicolas Lapierre both put the TS030 HYBRID through its paces at Paul Ricard, joined by 30-year-old Japanese driver Hiroaki Ishiura, who is a candidate to join the driver line-up at races where Toyota Racing participates with two cars. 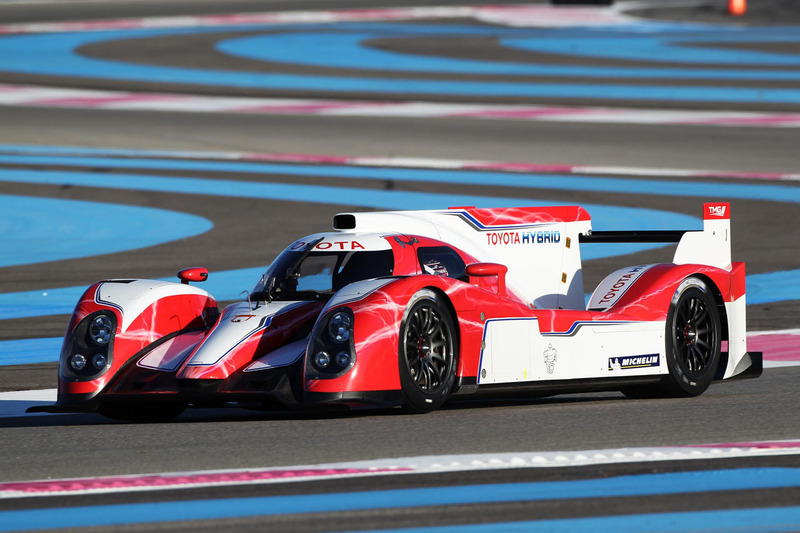 Official partners to the Toyota Racing programme include ZENT, Aisin, Nippon Steel, Takata, Toyoda Gosei and Michelin. Yoshiaki Kinoshita, Team President: "Of course we would love to win Le Mans; that is the dream for all competitors in this race. But we are realistic and we know we need to develop and to learn in order to compete with some very strong competition. 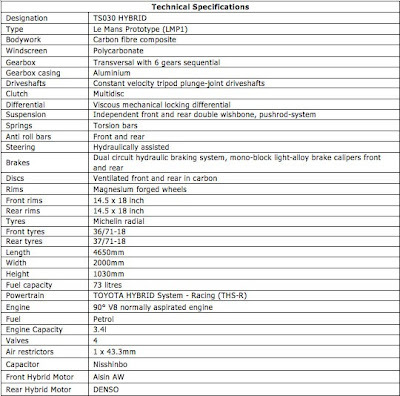 Our target this year is to show the performance level of our car and particularly the THS-R powertrain. 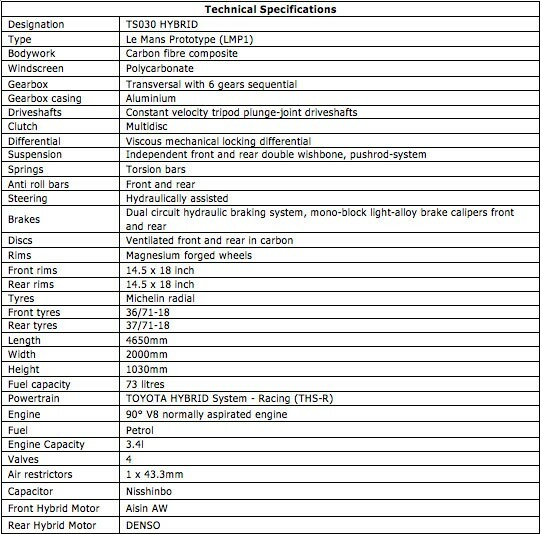 Hybrid is a core technology of Toyota so it is important to demonstrate this in a motorsport arena and we want to prove it can bring a performance advantage, both in terms of lap time and fuel efficiency. Everyone involved in designing, developing and preparing the car – both at TMG and at Motor Sport Division in Japan – has worked incredibly hard to reach this point and we are all very excited to be back on the race track again." Pascal Vasselon, Technical Director: "The two main performance drivers of our TS030 HYBRID car are the aerodynamics and the hybrid system. The regulations for hybrid powertrains allow us to recover energy under braking and release this to improve acceleration out of a corner, delivering lap-time benefit. For any given performance level, a hybrid powertrain will achieve this with less fuel so it is an extremely relevant technology and one we are excited to be bringing to endurance racing. Another key point in our development phase has been delivering aerodynamic efficiency. The development team at TMG has worked very hard to achieve an optimum aero concept using our state-of-the-art aero development processes based on combined wind tunnel testing and CFD. Judging by the positive feedback we received during the roll-out we have a very good base on which to build in the coming weeks." Hisatake Murata, Hybrid Project Leader: "Toyota has been working on hybrid systems for motorsport for several years, during which time we have made huge progress. Now we feel ready to bring our technology to the ultimate motorsport test: the Le Mans 24 Hours. Integrating a hybrid powertrain is, of course, a different challenge compared to a 'standard' powertrain. But we have worked together with partners such as DENSO, Aisin AW and Nisshinbo to develop the THS-R technology so it is part of the overall concept of the TS030 HYBRID. This technology will be used to recover up to 500kJ between braking events, energy which can be released via either front or rear motors to deliver a performance advantage. Toyota's hybrid technology has already won a 24-hour race – the Tokachi 24 Hours in 2007 – so now we are bringing the latest THS-R development to global motorsport; we know this is a technically-demanding exercise but we are well prepared for the challenge." Alex Wurz: "It was cool to drive the TS030 HYBRID car for the first time. Just leaving the garage on the electric power is very futuristic, then when you let the clutch go and the internal combustion engine kicks in it is like an old friend has returned! When we put on the slick tyre I could feel the car generates a very good amount of grip so I think we have a good base and I think we can turn this into a really fast car. I am definitely very happy but my nature is to also be analytical and therefore I know there is still a lot of work to be done. It's really good to work with all the mechanics and engineers; the Toyota Racing team is very international and this works well. I am very comfortable in this team because they are all extremely professional, that is really clear." Nicolas Lapierre: "My first impression from the roll-out was positive; the chassis is really advanced and the hybrid system works very well. The TS030 HYBRID car has good reaction to the steering with quick and efficient response combined with an impressive base level of downforce which is a nice feeling for a driver. It is totally different from anything I have known before because the philosophy is different. So our roll-out was promising and we saw the car's potential on several levels; we still have plenty of work to do but I think that we will have a strong package. We are starting from a blank page so the challenge is exciting." Kazuki Nakajima: "I cannot wait to drive the TS030 HYBRID for the first time. I spoke a lot with Alex and Nicolas about the car during the roll-out and it obviously has great potential. I have been doing a lot of time in the TMG driving simulator so I have got to know the car in a virtual world, as well as the Le Mans track; now it's time to drive it for real. It is a great opportunity for me and I am thoroughly looking forward to the experience of racing in the FIA World Endurance Championship with Toyota Racing. To return to Le Mans with hybrid technology is a big challenge for Toyota but it is also a real opportunity for all the drivers and I hope my recent Super GT experience will be a benefit. It's a great feeling to be involved in this project and I am really motivated for this season."